2. 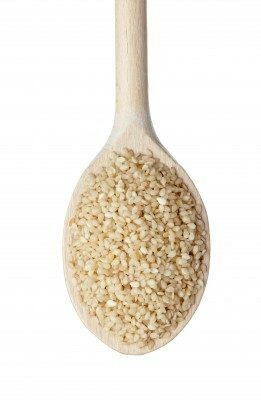 High Blood Pressure: A study published in 2006 in the Yale Journal of Biological Medicine showed that sesame seed oil has a beneficial effect in hypertensive patients on either diuretics or beta-blockers. Substitution of all dietary oils with sesame oil brought down systolic and dystolic blood pressure to normal, in addition to decreasing lipid peroxidation (bodily rancidity) and antioxidant status. One of the compounds identified behind sesame seed’s antihypertensive effects are peptides that act as angiotensin I-converting enzyme inhibitors. 4. Infant Health/Massage Oil: A study published in the Indian Journal of Medical Research in 2000 showed that massaging infants with sesame oil improved both their growth and post-massage sleep, in comparison to control oils such as mineral oil. 6. Antibiotic-Induced Kidney Damage: Sesame seed oil protects against gentamicin-induced kidney damage in rats by reducing oxidative damage caused by the antibiotic. 9. Radiation-Induced DNA Damage: Sesamol has been shown to protect against gamma radiation-induced DNA damage, likely through its antioxidant properties. It is capable of reducing mortality in radiation treated mice, in part through preventing intestinal and spleen damage. When compared to another powerful antioxidant, melatonin, it was found 20 times more effective as a free radical scavenger.